600 places to eat, sleep and shop vegetarian. Covers Cheshire, Cumbria, Derbyshire, County Durham, Lancashire, Lincolnshire, Manchester, Merseyside, Northumberland, Nottinghamshire, Tyne and Wear, Yorkshire, Isle of Man with big sections on Hebden Bridge, Hull, the Lake District, Leeds, Liverpool, Newcastle, Nottingham, Sheffield, York. Detailed listings include prices, opening times, sample dishes, website, child and dog-friendliness. 99 totally vegetarian restaurants and cafes. 60 vegetarian, vegan and veggie-friendly hotels and guest houses. 180 more cafes and ethnic restaurants with big vegetarian menus. 40 pubs specialising in veggie and vegan food. 280 local wholefood stores and delis, with full details of what each of the 140 independents specialise in. Caterers, local groups. 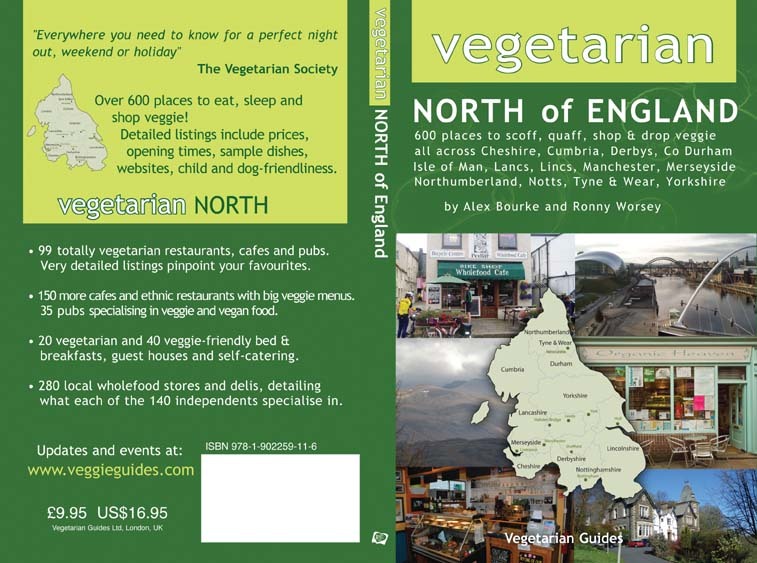 Includes map of the region, veggie maps of York and Liverpool, four indexes (vegetarian, A-Z, locations, caterers). Highlights and top 10 city and country veggie hotspots to help you choose where to go first. 240 pages, photos.